During construction of the skate park, the park will remain open and accessible outside of the project area (pavilion, play areas, fields, etc.). Please note that Phase 1 Park Improvements at Geary Park (walking paths, outdoor fitness equipment, basketball court) are planned to start this summer (July/August). Will the skate park be open and free to the public? Yes, the skate park will be unfenced and free to the public during normal city park hours. Will the skate park have lighting? If funding is available, timed light fixtures will be implemented to increase visibility and safety during dusk hours. We are currently exploring lighting options, including solar. Will bikes and scooters be allowed in the skate park? Although the skate park is designed for skaters, it is being constructed to handle bikes and scooters as well. What sort of maintenance will the skate park require over time? Concrete skate parks are built to require little to no maintenance. The skate park is under warranty for three years. The city plans to have the skate park sealed annually to keep it in top shape. Does the skate park require additional insurance from the city? No. According to the Michigan Municipal Management Risk Authority (City’s Insurer), skate parks pose no additional risk than a playground or basketball court. How is the skate park being funded? The Tony Hawk Foundation awarded the City of Ferndale with a $250,000 grant to help fund the project. The grant is a match grant with the City of Ferndale contributing an additional $250,000 from the 2016 Park Bond. Will the skate park generate a lot of noise? Concrete skate parks emit less sound than most other park activities. Baseball games and playgrounds are typically louder. According to a study conducted by the City of Portland, Oregon Noise Control Office, a typical concrete skate park generates about 52 decibels of ambient sound at its center. An average conversation is around 59–63 decibels (source: www.skatepark.org, Public Skatepark Development Guide). Will people come from all over to use the skate park? The skate park is designed to be a neighborhood skate park (11,000 square feet). This is not a “destination” skate park facility that will draw people from all over. It is a local attraction for the neighborhood and our residents. When will the skate park be built? We are planning to start construction in April 2019. Construction is anticipated to take 3–4 months. The skate park should be completed by August 2019. ‍What is the best way for me to stay informed on project? There are several ways to stay informed on the park improvements: check the Ferndale Parks & Recreation Facebook page regularly, check the City’s website regularly, and provide your email to our office to be included on update emailings. The final design for Geary Park is in process, including feedback received from the community following the Community Design Meeting and Open House. We plan to present the final design to City Council for approval on November 13, 2018. How are the park improvements being funded? The Parks & Recreation Department has received a Michigan Department of Natural Resources (MDNR) Trust Fund grant in the amount of $165,700, including the City’s 50% grant match. Improvements under the grant include access pathway, park bench, recycle bin(s), landscaping, drinking fountain, exercise station(s), and waterless urinals. Additional park improvements will be funded from the park bond, General Fund, and/or future grant funding. When will park improvements begin? Park improvements will begin Spring/Summer of 2019. The planned improvements will be completed in phases as funding becomes available. 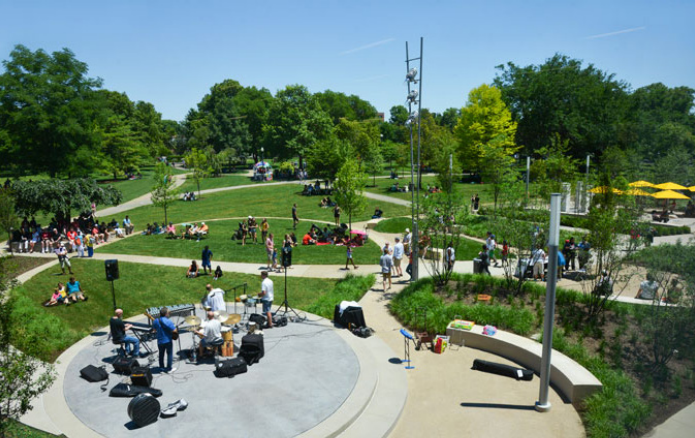 The Master Plan for Geary park will provide a complete plan that allows the City to be purposeful in the design, utilize the park space efficiently, and connect all the planned amenities through an ADA-compliant walking path. Which phase of the project will be completed first? Phase I will include improvements covered under our MDNR Trust Fund grant. Was the community involved in the design process? Yes, we worked with the City’s architect, Hamilton Anderson Associates, to hold a Community Design Meeting on September 20, 2018, and Community Open House on October 10, 2018. Are there any other parks being improved? Martin Road Park, Wanda Park, Schiffer Park, and a skate park are in the planning and design phase. Park improvements are planned to start as early as Spring/Summer of 2019 for majority of these parks. Where will the skate park be located? Currently, the three parks that are being considered are Wilson, Geary and Martin Road. What is the best way for me to stay informed on project? There are several ways to stay informed on the park improvements at Geary Park: check the Ferndale Parks & Recreation Facebook page regularly, check the City’s website regularly, and provide your email to our office to be included on update emailings. With the changes slated for Geary Park, what is the City doing to address the trees currently located within the park and ensure a healthy green canopy today and into the future? The City of Ferndale has been a Tree City USA-designated community for more than 15 years, and we pride ourselves on actively working to maintain a healthy urban forest. Throughout the full Geary Park improvement project (2019's Phase I improvements, skate park, and basketball court, as well as the not-yet-scheduled Phase II improvements), a total of 39 trees will be taken down. Of these, roughly 30% are in critical or poor condition, 60% are in fair condition, and 8% are in good condition, and 2% are not known. A number of these trees are, or will soon be, growing into power lines and are/will soon be at risk of being removed by DTE Energy. Also as part of this project, the City will be planting/adding a total of 125 trees. The City follows a per-caliper replacement schedule: for example, if a removed tree has a 20-inch caliper, several new trees would have to replace it (for instance, ten 2-inch caliper trees). The new trees have been carefully considered to provide maximum benefit to the area—water retention, potential canopy, and more. The final design for Wanda is in process, including feedback received from the community following the community survey, meeting, and open house. The final concept design was presented to Council and approved on October 22, 2018. How are the park improvements being funded? The Parks & Recreation Department has received a Community Development Block Grant (CDBG) to renovate the baseball diamond at Wanda Park, as well as a Michigan Department of Natural Resources (MDNR) Trust Fund grant in the amount of $82,000 (including the City’s 50% grant match). Improvements under the MDNR grant include access pathway, park bench, bike rack, recycle bin(s), landscaping, drinking fountain, and pavilion. Additional park improvements will be funded from the parks bond, General Fund, and/or future grant funding. When will park improvements begin? Renovation of the baseball diamond is complete. Other park improvements will begin Spring/Summer of 2019. The planned improvements will be completed in phases as funding becomes available. The Wanda Park Master Plan will help the City be purposeful in the design, utilize park space efficiently, and connect all the planned amenities through an ADA-compliant walking path. Which phase of the project will be completed first? Phase I was renovating the baseball diamond, which is complete. Phase II will include improvements covered under our MDNR Trust Fund grant. Was the community involved in the design process? Yes, the Parks & Recreation Department held a community meeting on July 17, 2017, at Wanda Park to present the proposed Park Improvement Plan, gain community input, and answer questions. We also worked with architecture firm Hamilton Anderson Associates to create and share a community survey in June 2018, and held a community open house on October 1, 2018, to present the concept design. Are there any other parks being improved? Martin Road Park, Geary Park, Schiffer Park, and a skate park are in the planning and design phase. Park improvements are planned to start as early as Spring/Summer of 2019 for majority of these parks. ‍What is the best way for me to stay informed on project? There are several ways to stay informed on the park improvements at Wanda Park: check the Ferndale Parks & Recreation Facebook page regularly, check the City’s website regularly, and provide your email to our office to be included on update emailings.